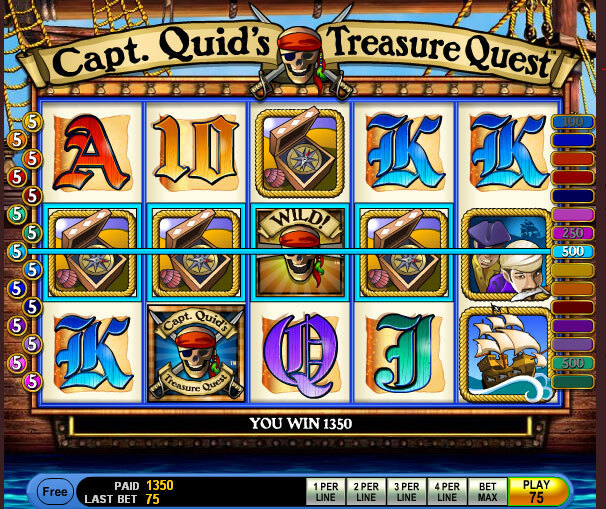 Captain Quid’s Treasure Quest is your typical pirate themed slot machine, with the just as typical treasure thrown in. Instead of burying a treasure, the pirate is looking for one in this case, using a treasure map to locate it. The game looks very good, which is quite normal for slots in this category, as few developers manage to mess it up. IGT is the creator of this particular game, and even though it’s not an original idea they had here, the game does warrant a bit of attention. You will discover only 15 lines in this 5 reel slot. A bonus game exists, which will give you free spins and up to 10x multipliers, and then you have a wild as well. The slot’s best payout is worth 50,000x, or $250,000. The game’s wild symbol offers you the top jackpot, while the Treasure Chest scatter will trigger a bonus game where you can win free spins and very high multipliers. To start with, let’s look at the wild feature. The logo of the game is used for it, complete with the skull of a pirate in the middle and two crossed sabers behind it. What I love about this symbol is the top jackpot it offers, though to get 50,000x out of it you need to have the maximum bet active. Lower wagers will give you 10,000x only for the same combo. As for the wild ability, it’s the one you expect, making the symbol capable of taking the place of regular icons, all nine that are used in the slot. 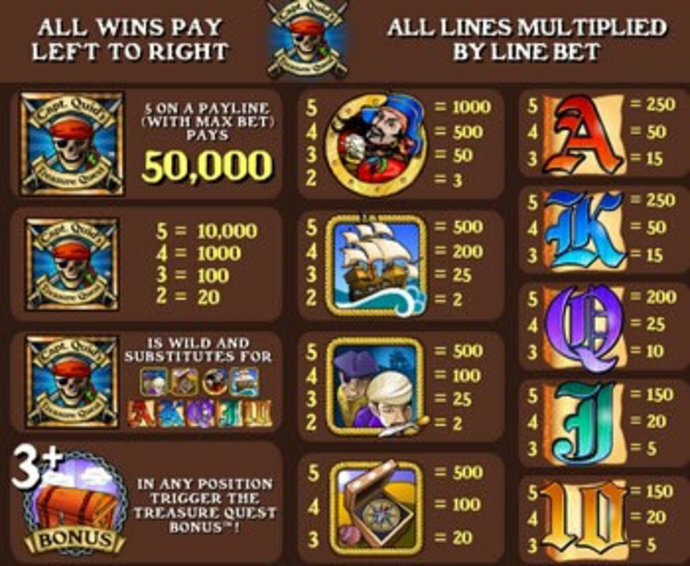 The slot’s bonus game gets started when the Treasure Chest symbol is found in at least three positions on the reels, no matter where exactly they land. A bonus game starts next, where you have a number of picks that you have to make. You have a treasure map in front of you, with black X marks on the islands. 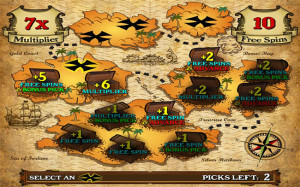 You choose from among those black X marks, and you get multipliers or free spins in each case, plus potential additional bonus picks and the option to advance to another island. The feature gives you up to 40 spins for free, while the multipliers can go as high as 10x. This feels like a great feature to trigger, with a very high potential for profit. You have 15 bet lines to use, with 1 to 5 coins that can be selected for each one. With the coins having denominations of up to $1, the line bet is $5 and the maximum bet is $75. 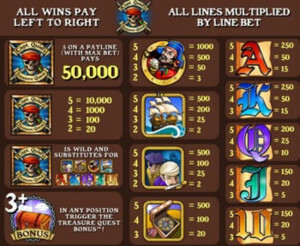 The only way to get a 50,000x multiplier on the line bet is to wager the maximum possible amount that round, meaning $75. Your reward will be $250,000 cash. A smaller wager will result in a jackpot of only 10,000x. The side of the pirate ship serves as the background for the game reels, and at the top you can see the ropes and sails. The symbols are well chosen and designed, though you have some playing cards as well. Those look like they’re handwritten on parchments, highly stylized and working rather well with the rest of the theme. It looks good, as it often happens with pirate themed games. Symbols: Game Logo (50,000x, wild), Treasure Chest (scatter), Pirate Captain (1,000x), Pirate Ship (500x), Pirates (500x), Compass (500x), Ace (250x), King (250x), Queen (200x), Jack (150x) and 10 (150x). This being a pirate themed ship, it’s only natural that you would have big treasures in it. The $250,000 top jackpot offered here is definitely worth pursuing, but you will need to spend $75 each spin to get that much. This Captain Quids Treasure Quest slot is offered by all online casinos with IGT software, playable either in practice or in real money mode.